The new AMD Ryzen Threadripper 1950X and 1920X processors are priced ₹82,008 and ₹65,488 respectively. AMD announces the launch of the company's much awaited Ryzen Threadripper high-end desktop processors here in India. The new AMD Ryzen Threadripper 1950X and AMD Ryzen Threadripper 1920X features 16 cores, 32 threads and 12 cores, 24 threads respectively, uses the new TR4 Socket, supports quad channel DDR4 and features 64 PCI Express lanes. The two new processors 1950X and 1920X is priced ₹82,008 and ₹65,488 on MD computers. AMD also announced that a third Threadripper 1900X with 8 cores, 16 threads will be available for purchase starting August 31st. 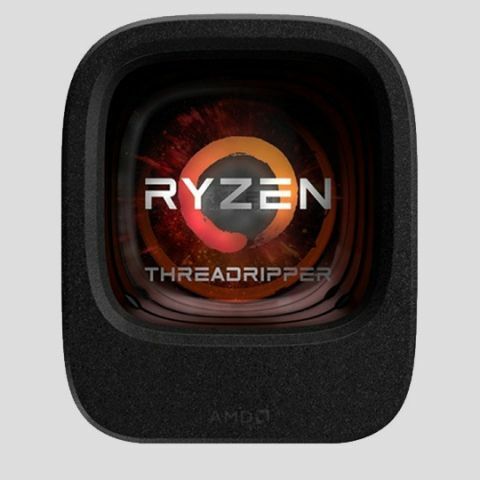 AMD released two models of its highly anticipated, Ryzen™ Threadripper™ high-end desktop processors, AMD Ryzen™ Threadripper ™1950X and AMD Ryzen™ Threadripper™ 1920X. During an already record-setting year for the company through the successful launch of several award-winning Ryzen™ desktop processors for the AM4 platform, today’s release of Ryzen Threadripper marks a major step forward in performance and features for the high-end desktop market, with the new processor exceeding the expectations of even the most demanding developers, researchers, prosumers, creators, and multi-tasking gamers. Built around the new AMD x86 “Zen” core architecture, Ryzen Threadripper delivers overwhelming power, unrestrained potential, and indisputable supremacy over comparable products in the market. Both new models of Ryzen Threadripper support the new SocketTR4 platform, sporting sixty-four PCIe® lanes, quad channel DDR4 memory, and AMD simultaneous multithreading (SMT). With support for 16 cores and 32 processing threads, the Ryzen Threadripper 1950X delivers unprecedented multi-processing power, the likes of which have never been available for consumer desktop systems before. The Ryzen Threadripper 1920X provides 12 cores and 24 processing threads and will be available on-shelf along with the Threadripper 1950X on August 10th, 2017. A third variant, the 8-core 16-thread Ryzen Threadripper 1900X, is expected to be available August 31. Whether rendering complex 3D scenes, streaming high-quality video game content, or encoding, compiling, and encrypting files in parallel of each other, the world-class performance per clock and efficiency of AMD’s “Zen” architecture means users can do so without sacrificing efficiency or performance. Ryzen Threadripper 1950X and 1920X processors include 40MB and 38MB of processor cache, respectively, and all Ryzen Threadripper processors from the $549 Threadripper 1900X to the $999 Threadripper 1950X feature the same Quad-Channel DDR4 memory bandwidth, 64 lanes of PCIe® 3.0 connectivity, and processor-direct SATA/NVMe/USB connectivity. In addition, every Ryzen Threadripper processor is multiplier-unlocked to provide unlimited user flexibility. A full ecosystem of SocketTR4 X399 platforms, with native USB 3.1 Gen2 10GB/s connectivity, provide support for all Ryzen Threadripper processors at launch, with motherboards coming from top manufacturers like ASRock, ASUS, Gigabyte, and MSI. In a testament to the multitasking and gaming capabilities of Ryzen Threadripper, Alienware has also launched its exclusive pre-built 16-core AMD Ryzen Threadripper™ Edition system to acclaim from high-end desktop enthusiasts worldwide. The new Alienware Area-51 Threadripper Edition, named “Best of E3” by Tom’s Guide and PC Gamer sports a similar Triad chassis design to that of existing Area-51 systems, but incorporates AMD’s powerful Ryzen Threadripper 1950X processor. Can you explain about AMD processors? what is the phone with high durability and high performance in 15k range????? which phone has best camera quality,bulid quality,and not heated in high performance?